Spending time at Scholastic Store is always fun! 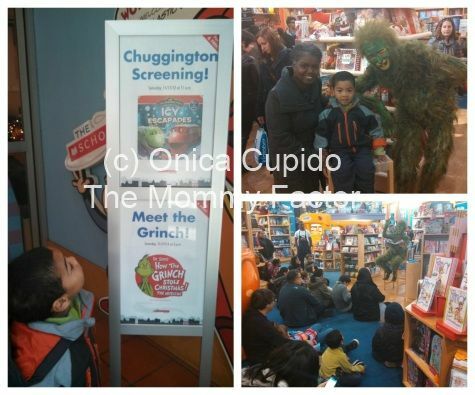 Recently we enjoyed some fun activities at the Scholastic Store SoHo playing with their Chuggington train-table and meeting the real life Grinch from Madison Square Garden’s Grinch musical! Note: I attend a public Scholastic Store event. I was not paid or requested to post about the event but it's The Grinch, of course I'm posting about meeting him! Any personal views expressed are always 100% my own. The Grinch was at Scholastic Store for a meet and greet and story time. Which book did the Grinch? Dr. Seuss How the Grinch Stole Christmas! Of Course! The kids (and many adults) sat quietly while the Grinch read this holiday classic. Then he posed for photos. Of course I had to get one with him and my son. My son will appreciate this photo for many Christmas holidays to come. After story time we enjoyed some time playing at the Chuggington train-table. Earlier that day the debut of the latest episode of Chuggington, Icy Escapades, was shown in the Scholastic Auditorium. We missed it since we went to the Rise of the Guardians Movie screening , but we were still able to enjoy the train table and pose for a photo in the Chuggington cutouts. Before leaving we toured around the store and learned more, aka played with, many of the toys that can be found in the store. There's lots of different toys to choose from for all age ranges. I love the Scholastic store. Thanks for sharing the teacher discounts. They always come in handy. 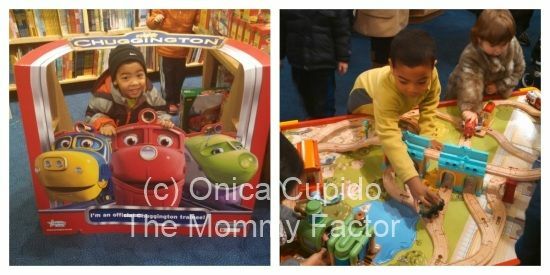 Looks like the two of you had fun with the Chuggington trains and especially with the Grinch. Cool!